Fig. 1. The agora at Mantinea before image fusion (left) and after image fusion (right), from WorldView-2, 11 September 2013 (© DigitalGlobe, Inc.; all rights reserved). Fig. 2. 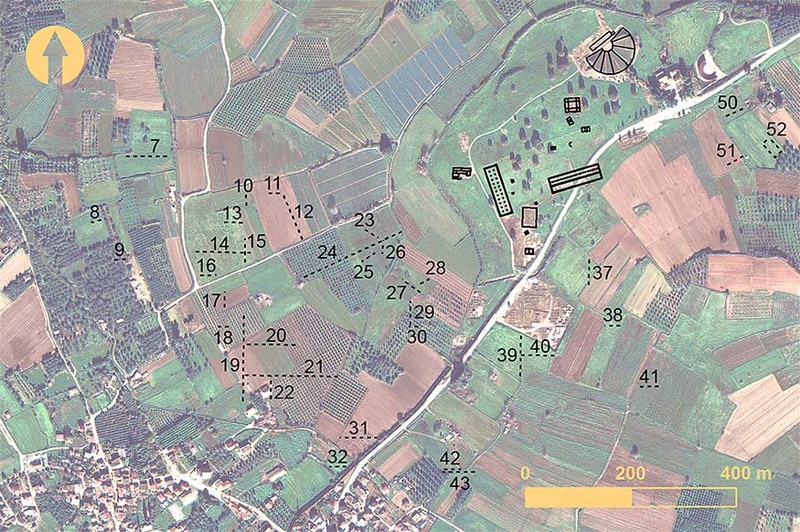 Buried streets identified at Elis (yellow arrows) from vegetation stress in a field south of the excavation zone, from GeoEye-1, 20 July 2009. 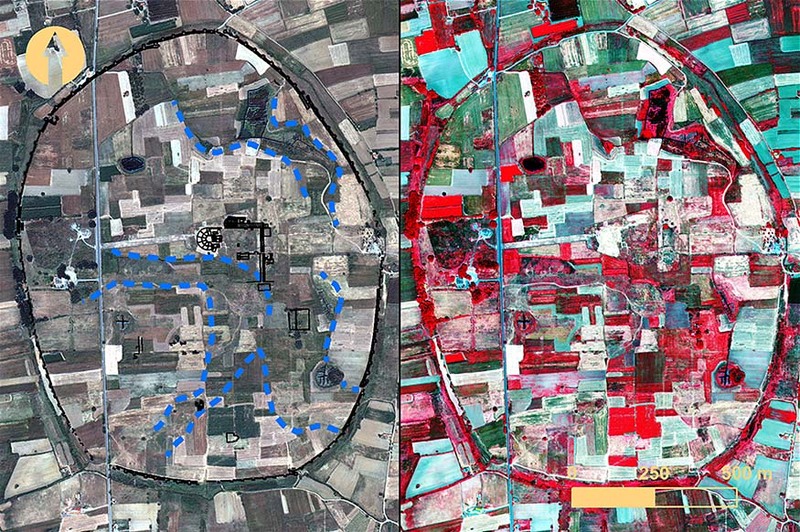 Although the streets are discernable in true-color RBG (top), other features are more easily seen when feature enhancement is applied—weighted difference vegetation index (WDVI), in this example (bottom) (includes copyrighted material of DigitalGlobe, Inc.; all rights reserved). Fig. 3. 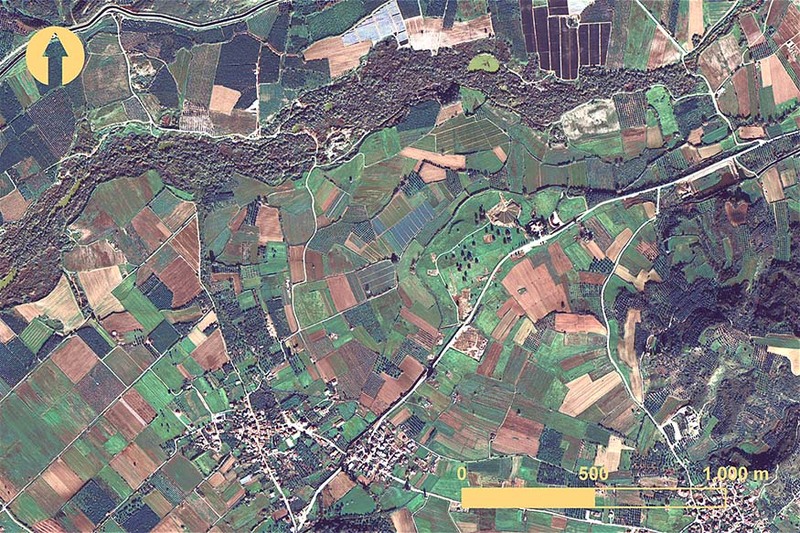 Mantinea from a QuickBird image taken 3 June 2012 (© DigitalGlobe, Inc.; all rights reserved). Fig. 4. The 1988–1991 electrical ground resistance survey at Mantinea (after Sarris 1992). Fig. 5. Surface anomalies in the northern region of Mantinea identified from remote sensing. 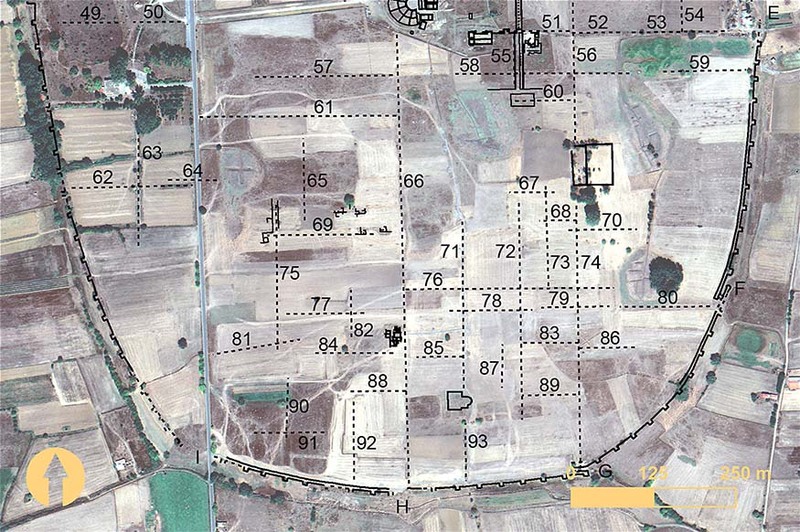 Numbers indicate surface anomalies, and letters mark the location of gates (includes copyrighted material of DigitalGlobe, Inc.; all rights reserved). Fig. 6. Surface anomalies in the southern region of Mantinea identified from remote sensing. 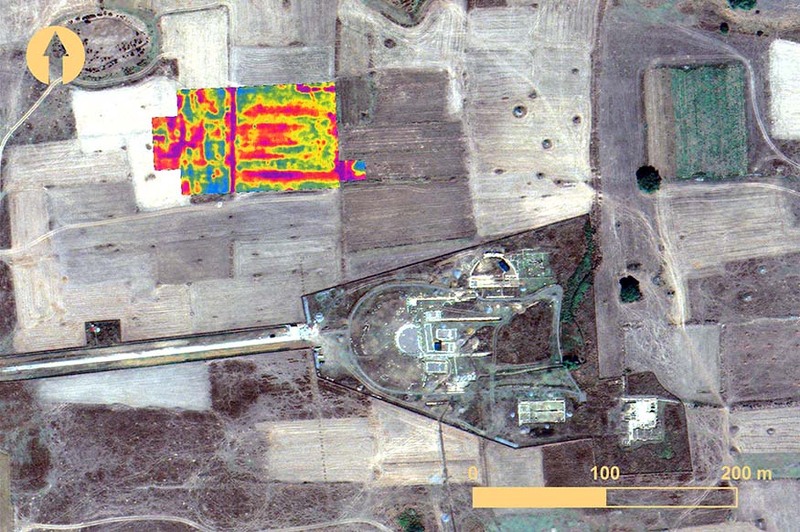 Numbers indicate surface anomalies, and letters mark the location of gates (includes copyrighted material of DigitalGlobe, Inc.; all rights reserved). Fig. 7. 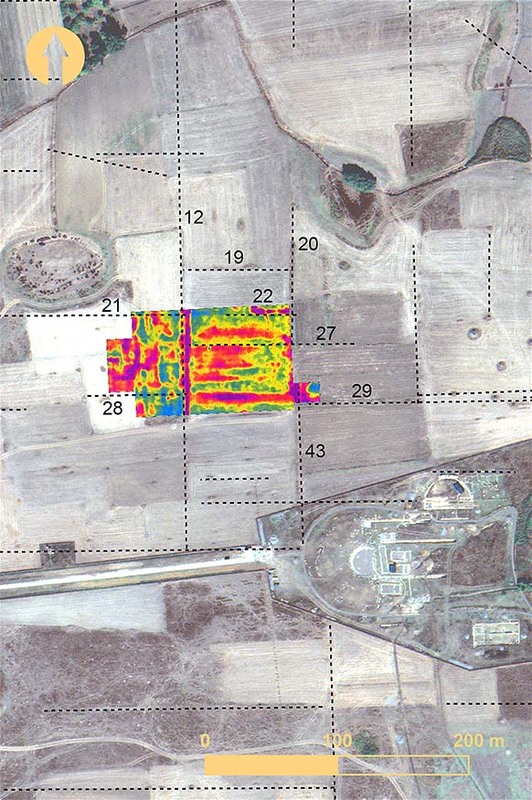 Surface anomalies from remote sensing relative to the 1988–1991 electrical ground resistance survey at Mantinea. Numbers indicate surface anomalies (after Sarris 1992). Fig. 8. 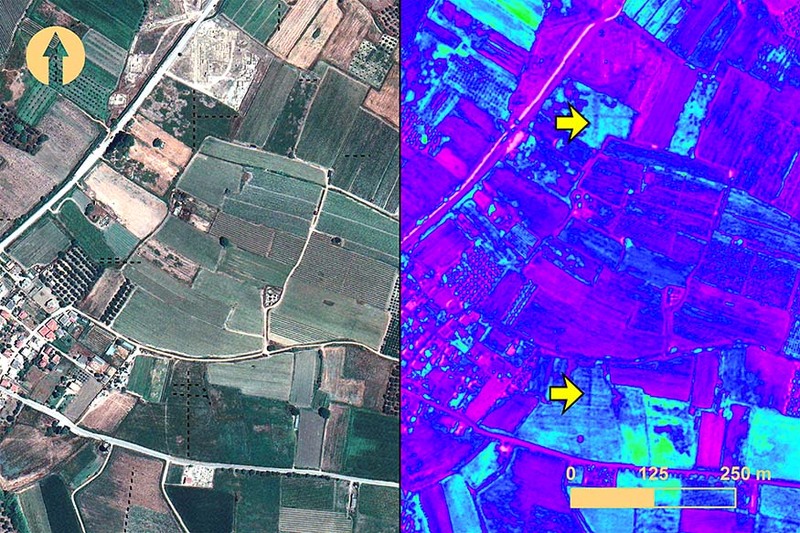 The northwestern region of Mantinea from a QuickBird image taken 3 June 2012: left, true-color RGB; right, normalized difference vegetation index (NDVI) feature enhancement. Black arrow indicates the location of anomaly 18 (includes copyrighted material of DigitalGlobe, Inc.; all rights reserved). Fig. 9. Major north–south anomalies (red) in the central region of Mantinea (includes copyrighted material of DigitalGlobe, Inc.; all rights reserved). Fig. 10. 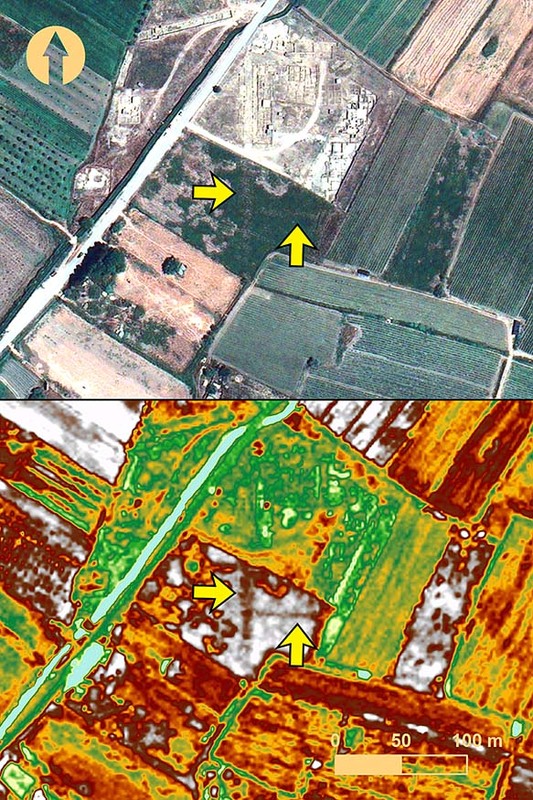 The northwestern region of Mantinea from a QuickBird image taken 13 September 2003: top, with green normalized difference vegetation index (NDVI) feature enhancement applied; bottom, with surface anomalies marked. 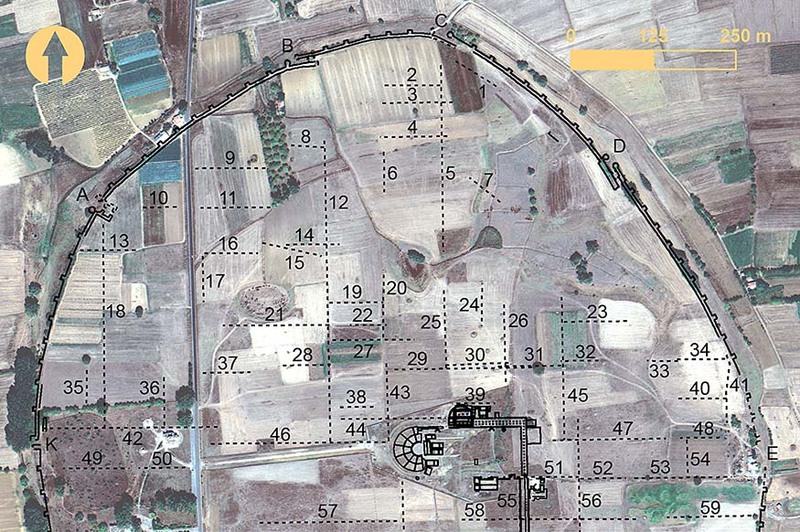 Black arrow indicates the location of anomaly 15 relative to Gate A (includes copyrighted material of DigitalGlobe, Inc.; all rights reserved). Fig. 11. 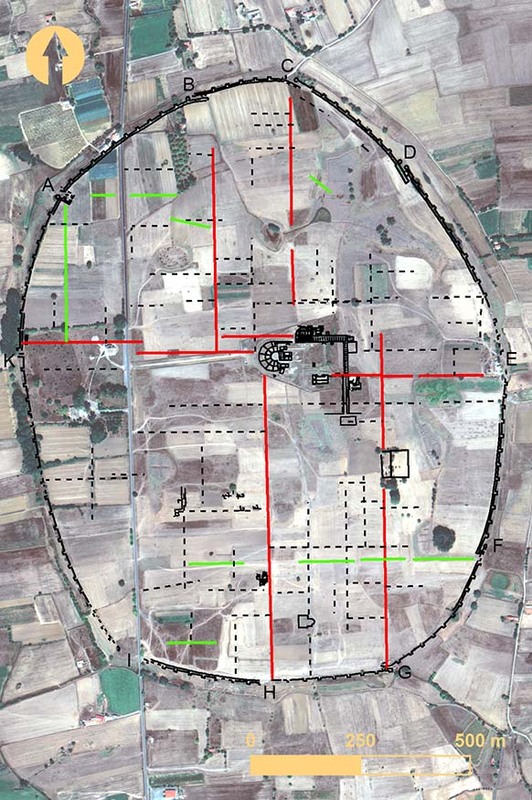 Surface anomalies (red) that provide communication between city gates and the agora, and surface anomalies (green) that link city gates to other regions of Mantinea (includes copyrighted material of DigitalGlobe, Inc.; all rights reserved). Fig. 12. 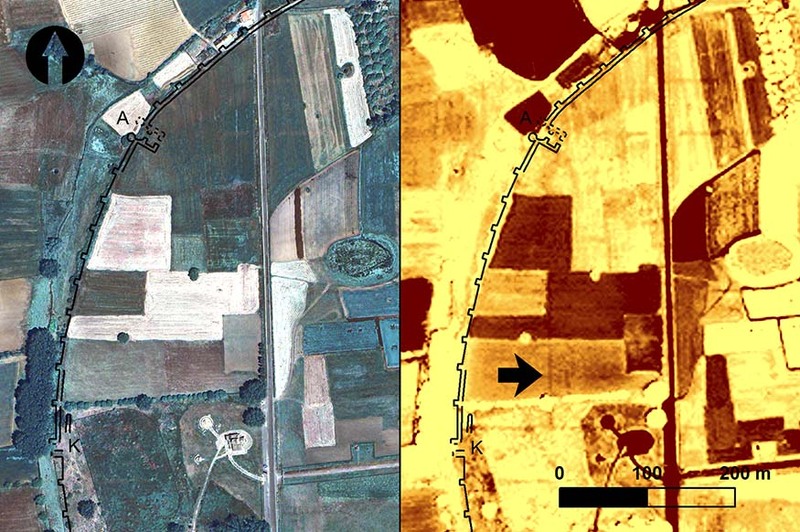 QuickBird image taken 10 June 2009 indicating the paths (dotted blue line) of possible paleochannels at Mantinea in true-color RGB (left) and false-color infrared (right) (includes copyrighted material of DigitalGlobe, Inc.; all rights reserved). Fig. 13. 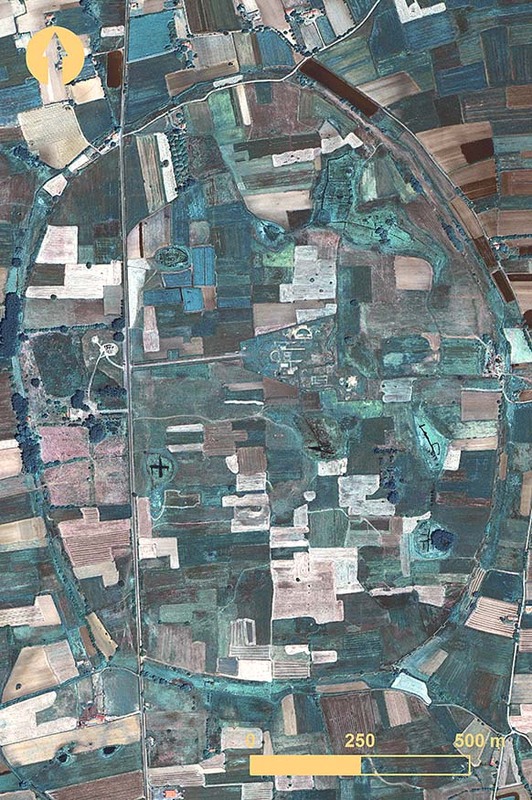 Elis from a WorldView-2 image taken 13 December 2012 (© DigitalGlobe, Inc.; all rights reserved). Fig. 14. Surface anomalies in the west-central region of Elis identified from remote sensing. Numbers indicate the surface anomalies (includes copyrighted material of DigitalGlobe, Inc.; all rights reserved). Fig. 15. 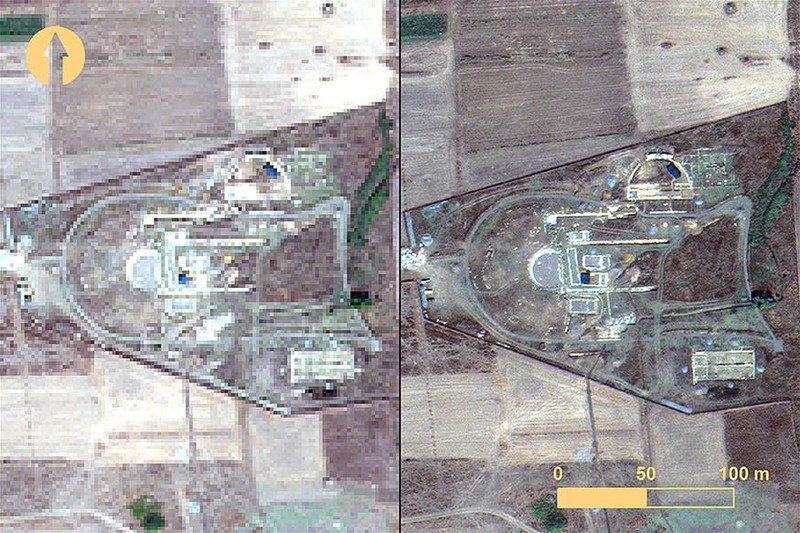 The southern region of Elis from a GeoEye-1 image taken 20 July 2009: left, true-color RGB; right, weighted difference vegetation index (WDVI) feature enhancement. Yellow arrows indicate the location of anomalies 39 and 44 (includes copyrighted material of DigitalGlobe, Inc.; all rights reserved). fig. 16. 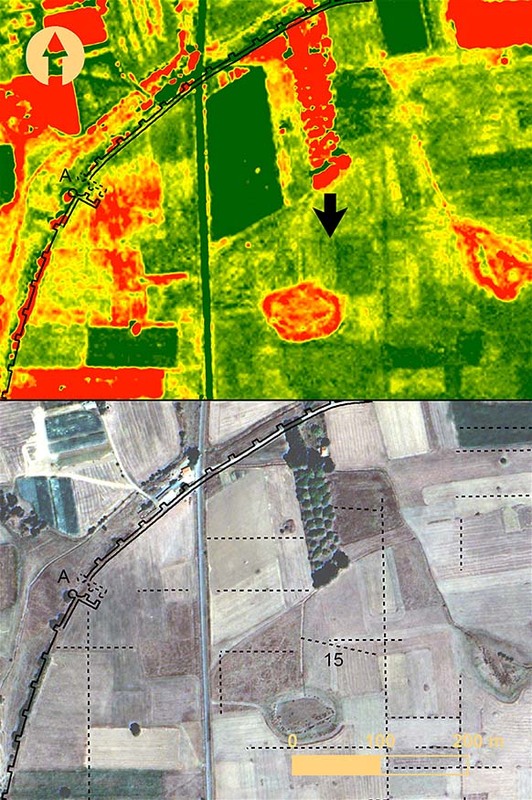 Elis from a QuickBird image taken 30 April 2010: top, with green normalized difference vegetation index (NDVI) feature enhancement applied; bottom, with surface anomalies marked by numbers. 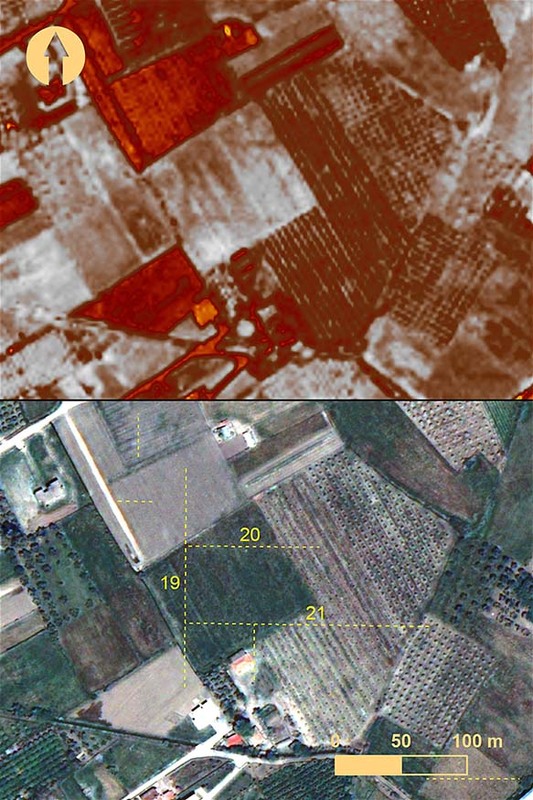 The linear outlines of anomalies 19–21 are distinct in the feature enhancement (includes copyrighted material of DigitalGlobe, Inc.; all rights reserved). Sarris, A. 1992. “Shallow Depth Geophysical Investigation Through the Application of Magnetic and Electric Resistance Techniques: An Evaluation Study of the Responses of Magnetic and Electric Resistance Techniques to Archaeogeophysical Prospection Surveys in Greece and Cyprus.” Ph.D. diss., University of Nebraska.